Last month, Marc Faber, publisher of the Gloom, Boom & Doom Report, predicted that a 1987 crash “will happen in the back half of 2013.” In 1987, the stock market boomed — until it collapsed on October 19, 1987, when the Dow fell more than 22%. I well remember it — I celebrated my 40th birthday, having warned investors to get out six weeks earlier. Since then, I’ve predicted bull and bear markets, but not another 1987-like crash because of various tools the federal government has put into place to keep it from happening. Even the 2008 bear market did not see a 22% decline in one day due to Fed intervention. One market-friendly money manager who is betting on another crash is Mark Spitznagel, director of Universa Investments in Santa Monica, Calif. He bases his pessimistic forecast on Austrian economics — the economics of Ludwig von Mises and Friedrich Hayek, and the Austrian theory of the business cycle. Like me, he has written a brand-new book on Austrian economics for investors. It’s called “The Dao of Capital: Austrian Investing in a Distorted World,” published by Wiley. I highly recommend it. He combines Eastern philosophy of ancient China and the Daoists with the Austrian school of economics (Mises & Hayek) in a highly entertaining and fascinating way. Spitznagel’s firm, Universa, spends hundreds of millions of dollars a year buying put options and other ways to protect one’s assets from another crash, defined as a 20% drop in the market. Universa’s adviser, economist and former derivative trader Nassim Taleb, calls it “black swan” hedging, based on his bestselling book “The Black Swan” (another recommendation). I agree with Spitznagel that the Federal Reserve’s easy-money policies cannot last and are creating another unsustainable inflationary boom that will end badly. But I’m not sure we are there yet. The Fed is still pumping billions of paper money into the system, and short-term rates are still very low. The broad-based money supply (M2) is growing now at an 11% clip. When they stop inflating, watch out below… But until then, this new money is likely to go into Wall Street. Spitznagel closely watches the Tobin Q chart, which compares the value of the stock market with corporate net worth. It helps determine the degree of speculative fever and mal-investment in the economy. Here is the up-to-date chart. 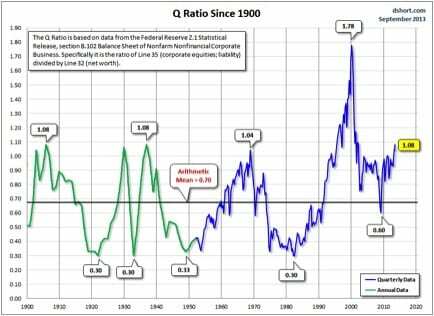 As you can see from this chart, the stock market is moving into the dangerous territory. At some point, it will be come apart, and we must be prepared. Mr. Ryder is certainly correct that high unemployment in Europe and America (the West in general) is a ticking time bomb. More and more youth are dropping out of the labor force and going on welfare. It’s bad enough that 12.1% (93 million!) are officially looking for work in Europe and 7.4% (11.4 million) in the United States. But among the under-25s, the European unemployment rate stands at 24% in June. In Spain and Greece, youth unemployment is above 50%. In the United States, the jobless rate is 15% for young people, and 40% for male black teenagers! This is Keynesian nonsense. The problem is lack of incentives to work due to excessively generous welfare systems in Europe and America, and government regulations causing labor inflexibility. Cato economist Michael Tanner, in his new study “The Work versus Welfare Trade-Off: 2013,” points out that it pays more in most states to be on welfare than to get a minimum wage job. In Europe, the problem is rules that prohibit firing workers, so companies are reluctant to hire. The sad commentary is that our generation of leaders doesn’t understand sound labor economics, and are making matters worse with proposals like hiking the minimum wage. P.S. For my own perspective on Austrian investing, please call Eagle Publishing at 1-800/211-7661 and order a copy of my new book “A Viennese Waltz Down Wall Street,” available for $19 plus $5 for shipping and handling. All copies are autographed! For more details, click here. O What a line-up at this year’s New Orleans Investment Conference, Nov. 10-13, New Orleans Hilton Hotel: If you haven’t heard Benjamin Carson, Dennis Gartman, Charles Krauthammer and Marc Faber, you’re in for a treat at this granddaddy of investment conferences. Other speakers include Peter Schiff, Rick Rule, Martin Weiss, Wayne Allyn Root, Ian McAvity, Gary Alexander and the Aden Sisters. I’ll be moderating the “global investment panel” with Dennis Gartman, Marc Faber, Adrian Day and Frank Holmes. Join me by calling 1-800/648-8411. Mention you are my subscriber and you will receive with your registration a FREE upgrade to Gold Club membership (cost is normally $189 extra), which entitles you to a private viewing area, Q&A sessions with top speakers, day-long coffee service and an individual photo with Ron Paul. For details, go to http://jeffersoncompanies.com/marketing/email/2013-08-08_NOIC_Eblast_Skousen.html. As U.S. President Obama is meeting with Washington leaders, trying to gain support for attacking Syria in retaliation for the perceived use of chemical weapons, global markets seem to be holding their breath.